Applications: For use on tube polishers such as Finitube. These belts are carriers for polishing compounds which can take stainless steel tubing right up to a mirror finish. Product Notes: Made of non-abrasive nonwoven material on a low-stretch backing. (Colour may vary from photo.) We suggest that you keep one separately for each grade of polish used in the process so as not to contaminate finer finishes with coarser grade polish. 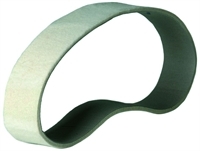 Also Available: Trizact belts can get you to a fine grade finish quickly. We stock polishing compounds suitable for tube polishing up to bright or mirror finishes.